When I started digging electric guitar...Sooooo many years ago, I was flipping my biscuit over Tommy Shaw. 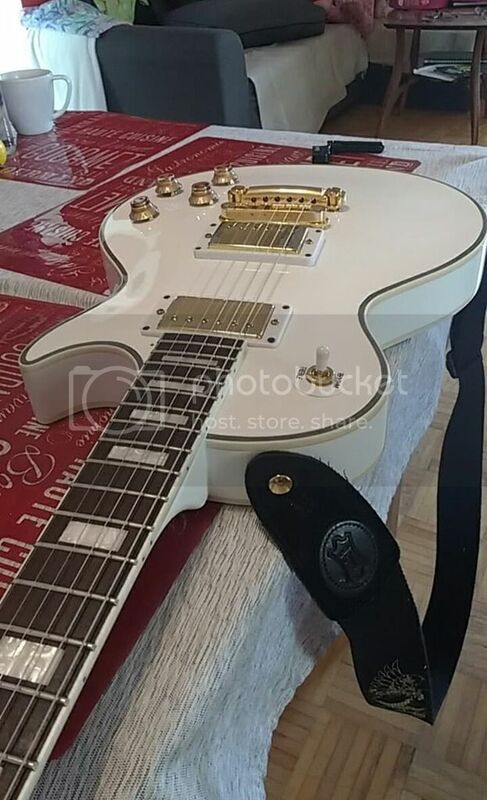 So I obviously craved owning a white Gibson LP Custom. in Montreal to get one. There weren't any in stock. I was told to place an order and wait for it to show up. Traveling to Montreal in those days (Had to ask my brother to drive me up there, still didn't applied to have my own license) was a bit of a stretch...Plus the excitement of replacing my $200 Sears Les Paul with the actual thing made me purchase my second choice which was a Tobacco Sunburst LP deluxe. I now wish I had kept it...But the 80s were unkind to the classic Strats and LPs. So finally, some 37 years later, that birthday wish came to fruition!! I opted for a used Burny which is about 99.9999999999% similar to the real thing. 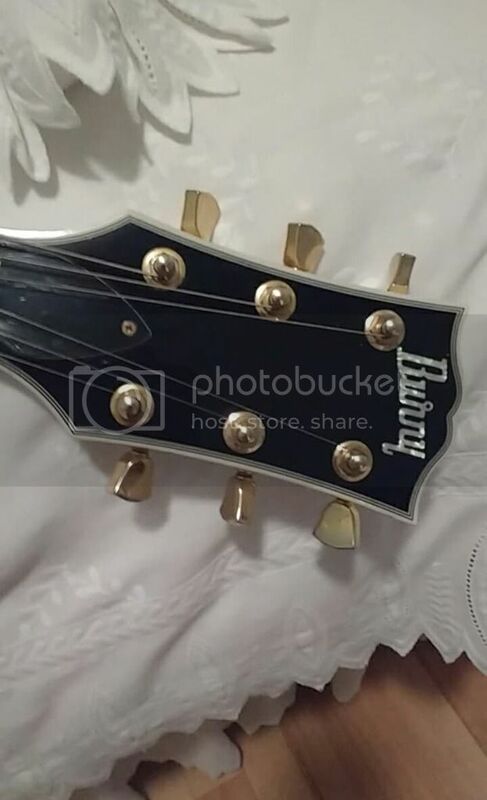 The only difference I see is the Burny logo on the headstock. ...And maybe some $2000+ of untouched money still in my pockets!!! make it look exactly the way I wanted it to. Got rid of the black plastics and went for a pure white and gold finish. So from this ( I already removed the scratch plate. As always). 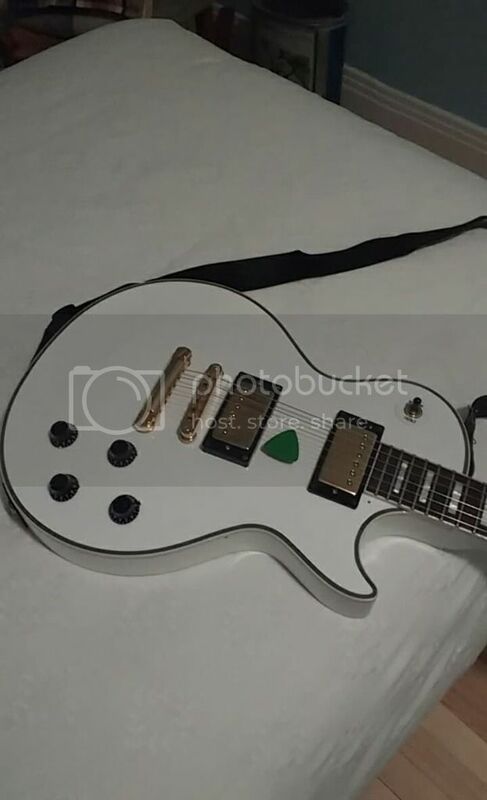 Very nice Chucky , I think the white PU surrounds & switch knob thingy and the gold knobs suit it. The black plastic(s) looked fine but the white really works IMHO.Happy birthday LoL. Very nice indeed kind of funny ive been researching those burnys as a les paul alternative. I have all Ibanez rgs but have always wanted a les paul. I have never played a burny but have heard only great things. Congratulations! I own a few actual Gibbys and then started trying out the "legit copies". I have a limited opinion about the coopies because it is just stupid to generalize guitar quality of a whole company's production just out of one (Or very few) guitar(s). Tokai: Well done. Indonesian version (Not MIJ). Good LP for a good price. Bacchus (MIJ): Beautifully done, but a bit weak tonewise. Burny: Real good. Great value. I don't mind it not being a Gibson. Orville (MIJ): The real deal. Exactly like a Gibson in every way. Same soul.